There are over 154,195 convenience stores in the US and the number of new stores is expected to grow double digits for the coming years. This shopping phenomenon represents 34% of retail sales in the US currently. Simple statistics show over ½ of all lottery tickets are sold through convenience stores and over 80% of convenience stores sell beer for example. A key to convenience store success is easy access to interstate and main thorough fare streets. This provides a detriment to the “predominant cash” business model in that it is also easy access for robbery and theft. There are over 32,000 robberies a year in convenience stores and nearly 11,000 of those will be robbed multiple times. The rate of robberies has been described as an epidemic and unless cost effective preventive actions are taken, customers and employees will continue to be at serious risk. Most of the reported violent crimes occur at night in these locations. The resulting damage from convenience store robberies can be physical, economic, and psychological in nature. A convenience store which is repeatedly robbed for specific merchandise can influence higher prices on certain products or as a precautionary action, the store may no longer carry the merchandise reducing overall sales. Independent stores owners can be more directly affected due to their size and ability to absorb loss and may not be able to recover from a robbery. The average cost to employers of a single episode of workplace violence can cost between $25,000 and $250,000 in lost work time and legal expenses. Customers who suffer injury along with the employees resist in face-to-face confrontations can lead to higher injury rates. Trauma can result in daily operations with loss of customers and also employee moral which can lead to loss of employee staff and loss of merchandise sales which can force some convenience stores to potentially close. Employee turnover rates for the CS is extremely high as well with the major cause being the implied safety/security concerns. Aside from video surveillance which is almost always forensic in nature and assists after an incident has occurred, there are typically two solutions proposed to the convenience store industry. The first is a “wall through” cash window. This is a designed to provide safety to the store operators but prevents shopping for other tangible things that bring thousands of dollars of revenue per week to a store. The cost of this solution is nearly $10,000 for construction, purchase of the cash drawer unit and installation. Another key point is many municipalities don’t like or approve the image a wall through cash drawer portrays in their areas. Another key consideration of a wall drawer solution is the loss of revenue. If an average patron spends an additional $5/visit and there is the opportunity for 100 patrons an evening, then over a 365-day period the potential loss of revenue is staggering ($182,500). A second solution for late night business is the building of an indoor encasement of “bullet proof glass”. This allows patrons access to the inventory for other purchases but is an expensive proposition that typically is an eye sore to the customer experience as well. The cost of the Bullet proof solution is well over $10,000 and the loss of merchandise theft typically increases from shoplifters as the store clerk is reticent to be outside of their enclosed area. Looking at the math equation a little differently a simple calculation identifies that the shoplifting rate can increase from a typical scenario of 3% to an increased level of 5%. Keeping time frames consistent the loss potential is north f $13,000/year in income. The third solution is a human guard or officer to protect the store, especially at night. The typical guard deployment is very expensive, and costs approximately $43,000 per year for one 8-hour shift per day. Guards have proven to be effective, however also bring numerous liability risks to the businesses. Guarding services have varying degrees of professionalism and deterrence potential and they often have turnover issues as well. The fourth option is to close during hours when stores are most at risk for violent crime. Each of the above security solutions go against the goal of being “friendly and welcoming.” While safety is a primary consideration of their operators and patrons, the desire is that the local convenience store becomes a place where the customer is appreciated and enjoys a good shopping experience. There is nothing about the proposed solutions above which leads to achieving this goal, other than the person may not be involved as the victim of a violent crime. They are costly fixes which create an atmosphere of isolation and perception of high crime. Blue Line Technology has developed an application solution that is designed to thwart robberies, and create an immediate deterrent and prevention to criminals. With over 120 years of law enforcement experience in crime prevention, Blue Line Technology has studied this application and has provided a solution where you can support the convenient stores’ mission to creating the best experience for their patrons. Further, the resulting safer work environment has been documented in interviews with employees. Store employees immediately understood the functionality of the system and its potential to keep them safe. 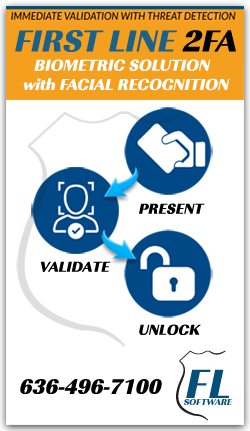 The “First Line” facial recognition/ID verification can be implemented to prevent undesirables and masked criminals from entering the premises, and the employees openly expressed gratitude their employer had purchased a tool to keep them safe. The product works in conjunction with existing surveillance systems and provides the operators the ability to keep the undesirable outside the premises and gives time so they can call for support from local agencies. The access control functionality can be outfitted with a switch operated by the cashier/clerk that allows them to actuate the system at a particular time in the evening or if they see any unwanted activity or violence outside the convenience store, they can immediately lock the door to keep indoor employees and patrons safe. Rob Forsyth, President of Moto Mart – considered an “advanced thinker and early adopter” of technology designed to enhance the customer experience immediately saw how the proposed solution could benefit his employees as well as provide a better experience for his patrons. He substantiated the market situation faced by convenience store operators and added in some cases his stores see 750 to 1,000 people per day. A large percentage of these (nearly 1/3) are after the hours of 10:00 pm when most crime occurs. Like many others Rob explained that some stores are prone to criminal behavior because of their location in proximity to highways. One of his busiest stores fell into the pool of repeated robbery statistics in early 2016. He was looking for a solution that his employees could embrace that would also conform to the municipalities request for open interaction with patrons. His store managers were allowed to work with the Blue Line product, interact and help design the implementation. Immediately the solution resonated with the store operators and in the first operational day – one operator, refusing to work the night shift reported that with this product implementation she would transfer to the night shift immediately, while another operator stated he was very pleased that his personal safety was in the thoughts and actions of the ownership of the store. The doors are locked using magnetic locks. A camera is strategically placed at the entrance and is used to read a patron’s face as they approach the store. Signage is used to clearly tell customers to look at the camera for entry. When a face is read, the magnetic lock is immediately actuated and the patron is allowed inside. This process happens “on the walk.” In the event a masked person approaches, he/she must either remove the covering to have the system record their face, or they will not be granted access. After careful review, clerks can choose to let this person in if they wish. Like other surveillance video cameras, a recording is made of entries and an ID number assigned. The video is maintained for a period controlled by the store manager or company protocol, similar to existing surveillance footage. If there is a need to review the footage (theft occurred, etc. ), the store manager can then place the subject’s face into the system for future immediate notification of criminal activity. The known threat can be kept from entering the store if desired. In the convenience store application, the appliance housing the software is a small device that fits easily in a back room or lower shelf. A monitor is strategically mounted for ease of visibility by clerks. Predetermined messaging instantly appears on the monitor instructing clerks how to respond if a threat is encountered. The clerks typically will not have the administrative privilege to do entries or other activities. The clerks simply see the person’s entry as either a red (threat), green (known safe employee), or unknown (safe customer). The enhanced video capability is set to run constantly throughout the day, even when doors are unlocked. The operators have a simple on/off switch that they can manipulate, turning the locks to active at any time they observe something outside that may threaten the safety and security of the employees and customers. Individual stores can format the system to their protocols. Over the past several months Blue Line Technology conducted two field tests working with store owners and managers. The objectives and results are provided. The first field test was provided to a corporate owned entity that has nearly 100 stores in a 5 state region. Their primary concern was employee safety and delivering a friendly customer experience. The Facial Recognition solution was installed at Store #1 for face capture to unlock store entrance at night. The operator was given control to manipulate and lock the door locks at a required set time from 9:00 PM to 6:00 AM. The test was run for a period of 30 days and registered and accounted for total unique records via access control from Store #1. The test demonstrated that when the patrons interact with the system, the process is easy and user friendly. All individuals were categorized unknown records and were captured for access entry into the business. Store attendants were required to lock the door from 9:00PM to 6:00AM. Each unknown capture record was directly emailed to host, and accounted for each night. Testing will dictate difference between “Unique Record Capture” records and “Total Records Captured”. All individuals were categorized as “unknown” records and were captured for access entry into the business. Store attendants were required to lock the door from 9:00PM to 6:00AM. Each unknown capture record was directly emailed to host, and accounted for each night. Testing differentiated between “Unique Record Capture” records and “Total Records Captured”. To distinguish between the two categories, a unique record capture takes into account a read if it occurs over a few second period and counts it as one unique read. The subsequent capture records will be accounted for in “Total Record Captures”. Duplicates records account for patrons who stood longer than needed, looked away and then towards the door to open, and conversing with other patrons, etc. If the same person came back at a different recorded time, they are considered unique again in order to have door access. Employees were counted and tallied in separate columns to ensure that they were not included in the total record capture. Employees do enter the front door for shift changes, or for breaks. This test results demonstrate that the employees did not have a significant influence on overall facial readings. All store attendants were visible and wore polos with the store insignia. These records were counted towards the employee column. The conclusion is that the system did not impact workers practices negatively as supported with follow up interviews. From 9:00 PM to 6:00AM traffic to the store was at its highest from 10:00PM to 11:00PM. The stores lowest traffic point was 4:00AM to 5:00AM. (See Figure 3) Capture activity was monitored daily. If known hours of operation were slower than previous days, the host could review recordings from that night to ensure the door was locked and to verify patron traffic was just low during the recorded time. This action was never taken as results continued to show patron traffic steady during the appropriate times. Crime for this particular store has been on the rise as of 2016. Crimes stats for 6 months prior to Facial Recognition were pulled and studied and compared to crime stats after the software was put in place. Patrons are aware of access control change to the night time activity of the store. This test will study the changes and/or behaviors in criminal activity and if it has a direct affect to the store, the employees, and the patrons who regularly visit the store. Crime stats that were available for publication were pulled and assessed around the stores location . The Crime stats were pulled from for a previous period from April 2016 – July 21, 2016. The final install was July 21, 2016. This store resides in the tail end of a district in a metropolitan city The rest of the store areas in the study are covered by bordering municipalities police departments and a river leading to another state. Crime stats pin-dropped on relative maps ( see figures 4, 5) represent convenience store, c-mart, gas station, liquor mart robbery’s within a certain vicinity of the location which has facial recognition access control for night time entry. The indicated robbery’s from the crime stats are from the date April 2016 – July 21, 2016 from the time of 7:00 to 8:00PM till 5:00 to 6:00AM. (See Results for reasons of increase time past locking hours of 9:00PM to 6:00AM) Maps from April, 2016 – July 21, 2016 will be created. A separate map will reflect crime stats after the install date from July 21, 2016 – December 2016. Crime that has occurred at the test store, police reports dictate both robberies occurred while the suspect was masked. Calls to service to the store in the study were also recorded for one-month prior at this address and compared to one month after. . The calls to service will continued to be monitored until December 2016. Crime stats pin-dropped on relative maps represent convenience store, c-mart, gas station, liquor mart robbery’s within a certain vicinity of the location which has facial recognition access control for night time entry. Patterns showed that robbery related crime was at highest time between 8:00PM – 1:00AM. These include the robberies that also have taken place within our own test store. Calls to service around the store included suspicious persons, theft from vehicles, and assaults. County Data does not reflect if all robberies were masked or unmasked at the time of entry. City crime data that we were able to obtain for the two robberies that occurred at the test store did show the suspect was masked during both separate events. Note : National articles have reported that 98% of these crimes are masked assailants. Current crime stats show that within the last month, robberies are continuing to occur. High robbery crime times are still occurring around the same estimated time frame of 8:00PM – 1:00AM. Calls to service within a month before and after comparison dropped significantly to one call. This was a result in an employee who was caught stealing/taking items of value from the store. After the first initial 30 days of install our representatives and techs re-visited the store manager and asked some preliminary questions about the application and about how the patrons of the store have reacted to the new technology. Overall experience with the technology is that they have an average of 250 customers at night, and so far, an estimate of 10 people have seen the system and have left the premise. Patrons who are women (customers and employees) love the system. Several women customers have commented that the system makes them feel safer during their visit at night. Employees love the system, find the overall process easy to use and interact with. The store manager has reported that he has been able to move affected employees of prior instances back to the night shift. Patrons have responded to the system and have adapted quickly to the new method entry. There are some patrons the employees have to address how to use, but they show the patrons and interactions between customer and employee are very positive and receptive. Calls to service to the store location have dramatically reduced 85% comparing July to August. The store manager is very pleased with this result as he has the potential to remove negative interaction with suspicious persons, loitering, and vehicle theft interaction. Crime with the local area have remained constant. A most recent robbery that happened one exit away, August 12, 2016, at a Waffle House before 5:00AM. Suspects held patrons at gunpoint, and another suspect shot of his weapon in an attempt to show he was serious and demanded cash. Both robbers were masked and heavily armed. The convenience store has no justification to store any record information unless the particular patrol creates a crime. Providing an extra layer of security and reporting methodology for the convenience store will aid in collaborative efforts in community policing with local law enforcement. Store Location #1 demonstrates that it is taking proactive measures to improve private security, target repeat offenders, and deter petty crime from occurring on the property. Though traffic flow, Blue Line’s Facial Recognition technology has had no detrimental impact to customer experiences, and have actually proven a positive increase in customer experience though safety and security. The independent CS store owner (having under 5 stores) expressed his interest in the system because of the high crime rate and rash of late night business robberies with masked and unmasked gunmen in the immediate area. This store had not experienced a robbery to date but the growing concern had mounted in the months leading up to the decision. The store owner reported – my desire was to take preventive action that discouraged criminal behavior. As in the previous test case the employees were given the opportunity to learn of the system and the capabilities and then participated in the installation definition/design for their store. This store ranged between 30 and 50 visitors in the hours from 10:00 pm to 5:00 am. During the day the store was seeing nearly 30 people an hour. Customers have adopted the system readily and report a confidence level as they enter and exit the store. In the period of (March 1, 2016 – September 1, 2016) 183 days and the area was designed as the store plus a 2- mile radius. A two camera system was installed covering the two entrances into the store – one on each entrance. The system was turned on March 1, 2016. Initially no “threats were inserted into the data base” and on day 180 the store owner reported no incidents at the store and therefore had not added any known threats to the location. During the time frame of the test — There were 22 robberies with masked gunmen and 8 robberies with unmasked gunmen in a 2- mile radius of the convenience store. All of the indicated robberies were late night between the hours of 10:00 pm and 5:00 am. The store in this study, with the Blue Line Facial Recognition installation was not robbed. There is a growing safety concern with late night business experiencing armed robberies and mischievous behavior that has led to detrimental customer experiences and employee turnover rates for these properties. The Blue Line “First Line” facial recognition has proven to be a cost effective solution strategy for keeping problems away from the store and adjoining property. The application implementation, designed with seasoned law enforcement expertise, has been effective in reducing costs of operations, increasing employee morale and consumer confidence in the municipality. The convenience store owners/managers have proclaimed the original goals of employee safety, a community based safe shopping experience has been achieved with the installations of First Line. The cost of the solution was much lower than anticipated and the aesthetics helped provide a welcoming atmosphere with a certainty of deterrence. Milliman, Inc., a premier global consulting and actuarial firm, today released the 2016 Retail Cost of Risk, which measures the cost of property and casualty risks faced by retailers. In 2016, the average cost of risk for U.S. retailers is projected to amount to $5.93 per $1,000 of sales. Around 60% of the costs is attributable to the injuries of employees and customers; workers’ compensation costs represent around 40% of the overall risk and the cost of customer injuries represent around 20% of the total. Other risks, including property damage, cyber, and miscellaneous liabilities, account for the remaining 40%.